Looking for that special secluded getaway with your love to disconnect from the world and connect with the things that matter? 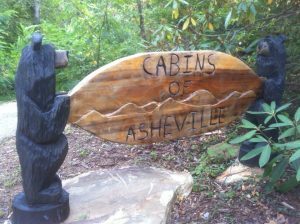 Cabins of Asheville offers beautiful log cabins and cottages nestled in the midst of 14,000 acres of the Pisgah National Forest. We are centrally located in the Blue Ridge Mountains of North Carolina between Asheville, NC and the entrance of the Great Smoky (Smokey) Mountain National Park. It is close enough (20 min) to visit Asheville, the Blue Ridge Parkway, or the Biltmore House, yet far enough to give you privacy and seclusion. Each dwelling is solid wood interior. A beautiful, handmade cotton quilt will keep you warm on the cool mountain nights. Each cabin is equipped with a gas log fireplace, air conditioning, hot tub, gas grill, outdoor table, and a private covered porch. Satellite TV (including HBO, Cinemax, Showtime, Stars), wireless internet, DVD/CD player and many great books are available. And most cabins/cottages are Pet Friendly! Whether coming from far or near, we will make you feel right at home and escape the hassles of everyday life.